Humble Bundle offers some excellent deals on maybe eight or nine games at a time. 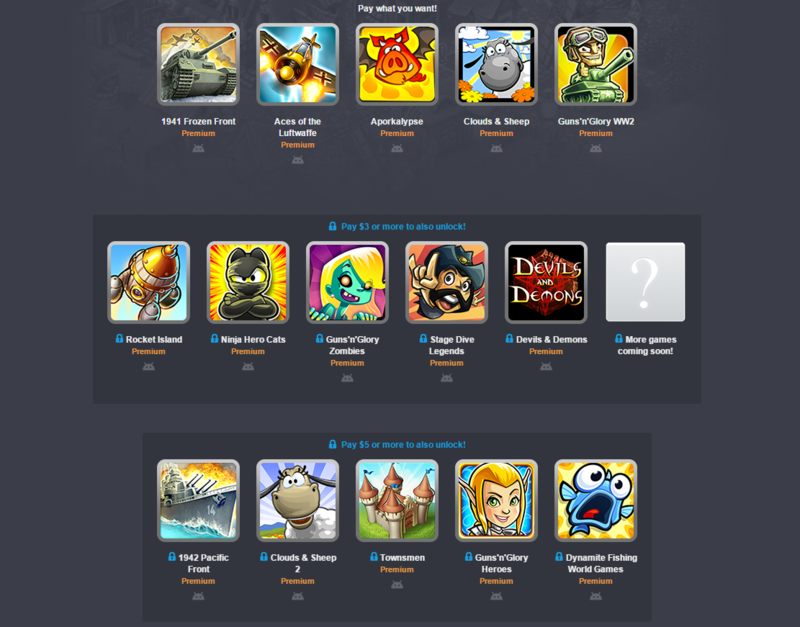 The new bundle being offered in cooperation with HandyGames is even more impressive. If you unlock all the tiers, this bundle includes 15 games with more to be added soon. This is a three-tier bundle, which has been common lately. However, none of the levels are based on the average price. The bottom one is name your own price, but the second and third are $3 and $5, respectively. Just pay those amounts or more and you unlock the games. Each tier currently has five games, but the middle tier will be getting more of them in a week. Just make sure that one is unlocked to get all the new stuff. Some of the popular games included in this bundle are Guns'n'Glory WW2, 1942 Pacific Front, and Townsmen. They're mostly strategy games of various types, but there are a few RPGs and arcade games too. These are all the premium versions of the titles, so you should not encounter any artificial speed bumps that push you toward in-app purchases. The bundle runs for two weeks as usual.